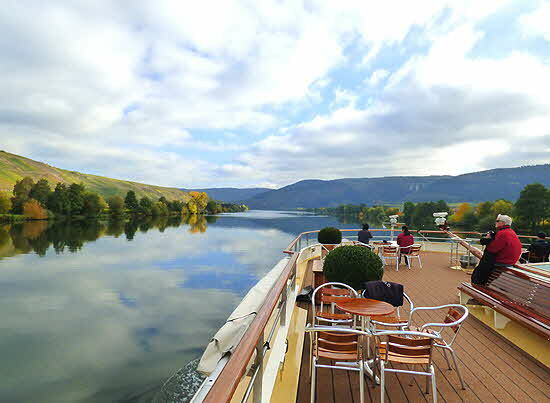 Long had I coveted taking a river cruise and this autumn my dream was realized when we sailed the Legendary Rhine & Moselle (Mosel) with the top ranked UNIWORLD Boutique River Cruise Collection. 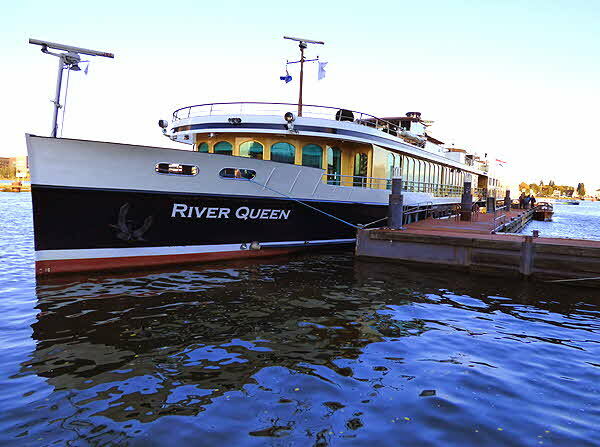 The 13-day itinerary was aboard the River Queen, one of UNIWORLD’s fleet of luxurious ships that ply the rivers and waterways of the world. Their fleet covers 22 rivers in 26 countries. Our cruise departed from Amsterdam and ended in Basel, Switzerland so SWISS Air International provided the best connections for us and after a comfortable flight we arrived in Amsterdam. UNIWORLD offers transfer services from the airport to the ship but we arrived a few days early to revisit the city (see Amsterdam story), so instead on the day of departure we were picked-up promptly at our hotel the Radisson Blu Hotel Amsterdam, and driven to the dock. Waiting for us was a long sleek white ship detailed with blue accents, and a warm and very welcoming staff. 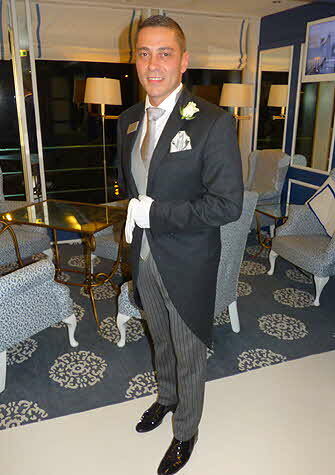 We entered into a handsome reception hall and were greeted by our personal butler Valentin, outfitted in traditional dove grey morning coat, striped trousers and wearing gloves. Valentin ushered us to our suite but not before we had a chance to take in the lovely delft blue and white interiors and notice that they were well-maintained and beautifully decorated with handsome color-coordinated fabrics and furnishings. Valentin explained the layout of the ship; there are 3 levels of accommodations and we were situated in one of the 4 suites located at the top level. Our suite was decorated in the delft blue and white featured throughout the ship, with a wonderfully comfortable king size bed, fabric walls and matching head-board with plenty of closet space and lots of drawers. There was an en-suite safe, refrigerator, digital clock radio, and flat screen TV although we had no time or interest in watching television when there was so much to see and so many new people to become acquainted with. 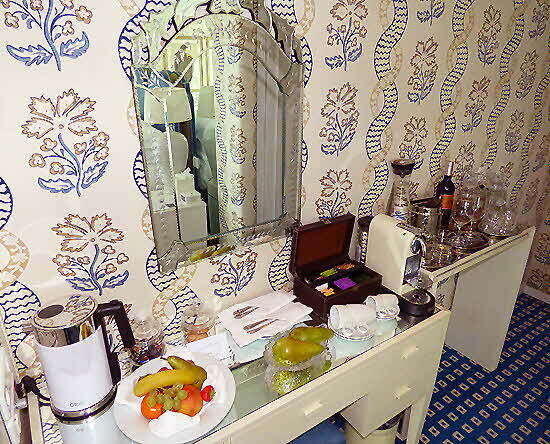 Our suite was dressed with a Nespresso machine, supplies of coffee, tea and hot chocolate plus bowls of sweet treats and fruits and every evening a supply of just-baked cookies and fresh fruits were delivered while we were at dinner. Our suite also had crystal carafes of Whiskey, Vodka, Brandy and a bottle of wine but since there was an open bar in the lounge we didn’t feel the need to imbibe in the privacy of our cabin, after all cruising is very much a social enterprise. Conveniently, Wi-Fi is available throughout the ship and there is a computer station located in an alcove near the reception desk. A gift shop is located behind the reception for on-board shopping or forgotten personal items. 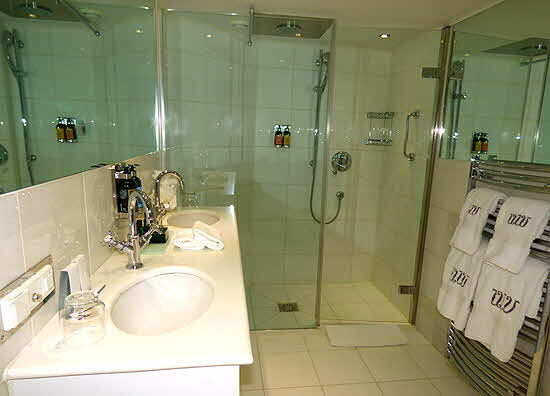 Our bathroom was large and well appointed with a hanging heating towel rack, English rainmaker showerhead, hair dryer, lighted make-up magnifying mirror and Hermes amenities. Monogrammed towels were large and fluffy and refreshed every time we left the cabin. The service was outstanding; from the attention of Valentin to the house keeping staff (Ioana was our stateroom steward) every need was anticipated and promptly attended to, including same day laundry service which on a long trip was a blessing. The suite had large, clean, full length windows offering an unobstructed view of the passing scene. Digital controls opened the windows when the weather was nice and had the very important feature of movable screens to keep out bugs. But with the large lounge with an open, manned, liquor bar and a 24/7 supply of treats and soft beverages, we spent little down time in the cabin. An automatic hot beverage machine in the lounge made wonderful hot chocolate and I became addicted to adding 2 plump marshmallows to my cup before filling it with the delicious brew. One day, after returning from our daily city or castle tour, I headed for the marshmallow bowl and then to the beverage machine and by accident hit the cappuccino button... and voila a new taste treat was born... give it a try, it’s delicious! A UNIWORLD cruise is cash free, 5-star resort style with an all-inclusive philosophy. Upon booking you are sent a welcoming introduction package containing needed travel documents and ship layout; plus detailed itinerary and highlights on ports of call; daily excursions with the level of difficulty for each; tips on weather, what to wear, customs and other bits of knowledge that will aid in making the journey as carefree and enjoyable as possible. UNIWORLD offers a one-stop full service travel facility and can arrange for air, hotels, transfers, tours, land extensions, etc., literally everything that you require in addition to the cruise package. Getting on and off the ship is made easy with an electronic card insuring that you can come and go as you please when docked and that no one can board that is not authorized to do so and that the ship would not depart without you. Printed maps and daily schedules were placed on the reception desk to grab before each tour and wireless communicators were given out on the first excursion to make receiving the guide’s commentary available to everyone on the tour. And waiting to receive you back was our lovely Hotel Manager Silvia Anghelescu, usually stationed behind the reception desk but always approachable when a question or special service needed attention. Silvia, and the entire crew, had worked together for many years and they operated seamlessly, like a family welcoming you into their home. The staff hailed from middle-European countries and spoke fluent English with slightly different accents but with universal smiles. The size of UNIWORLD ships allow them to dock within walking distance of the myriad towns we stopped at along the river and in addition to the daily guided walking tours there was access to bicycles and Nordic walking sticks for one to explore on their own. On the lower deck of the River Queen was an exercise room for those that preferred their bicycles stationary and a spa with Tihomir, a highly trained masseuse and well-being coach. Afternoon tea, with the talented Brendan on the piano singing all our favorites was offered in the lounge daily and every evening, prior to dinner and after the cocktail hour, our effusive and highly knowledgeable Cruise Manager Preston Coe held sway outlining the program for the following day. Some days, in addition to the included tour, there would be an alternative special excursion for a fee and Preston covered all the bases. Tours were always organized in small groups with one group “slow and easy” for those that had difficulty with those pesky cobblestone streets and hills winding up and away from the river. As the cruise progressed I imagined that the ship was riding lower in the water which I attributed to the constant flow of food (sic). Of course it was not mandatory we eat as often as meals were offered but it was too difficult to turn down those appetizing and abundant spreads. Breakfast was part buffet, part service with hot and cold dishes and always an egg station for freshly cooked the way you like them eggs. 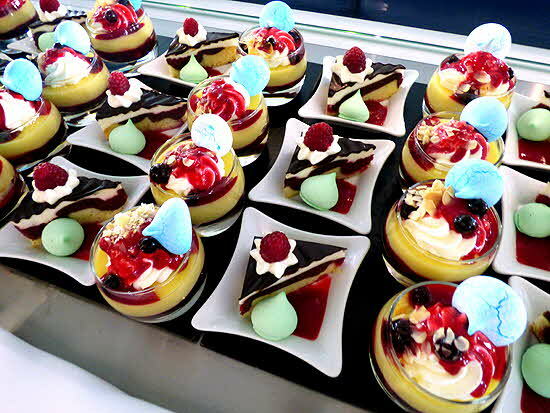 Each morning I had to make a decision to go for the thick, creamy oatmeal cooked just the way I like it or the smoked salmon with caper fruit on cream cheese bagels or the eggs Benedict or... well there was so much to choose from including fresh fruits, pastries, meats and cheeses. Every morning I would promise myself if I went heavy on breakfast I would go light on lunch... until I saw what lunch consisted of. Lunch also was part buffet and part service with always a cooked meat offering as well as soup, pasta, fish and other hot dishes. I could not help myself from tasting the local specialties in addition to a big salad from the always fresh ingredients. 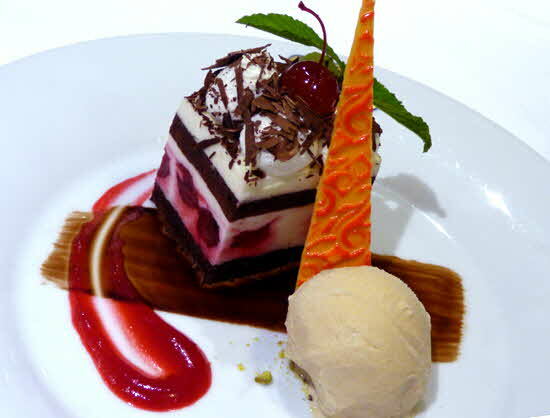 I did manage not to have dessert for lunch, although it was a hard decision. Every night dinner was a leisurely event with multiple gourmet offerings cooked to special order. A number of house wines were paired with the different dishes and of course selections from the bar were always available. 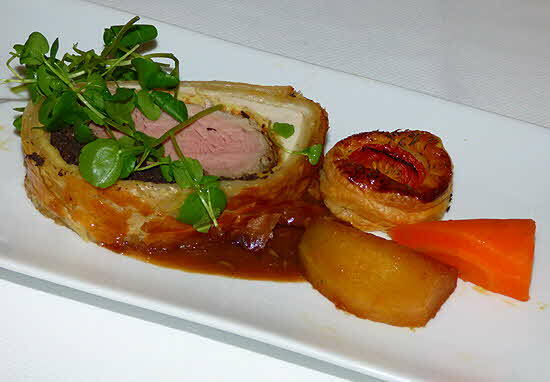 All the produce was sourced locally and selections were based on season and availability. One morning when leaving the ship we saw crates of mushrooms being loaded and at lunchtime, just-made mushroom soup was on the menu. 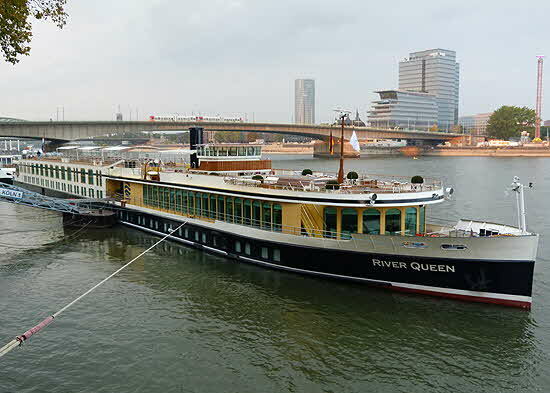 UNIWORLD is family-owned and constantly upgrading its ships, d�cor, itineraries and menus which likely accounts for them being named the Best Luxury River Cruise Line two years in a row by the prestigious Cruise International Awards and ranked top river cruise line by Travel + Leisure World’s Best Awards 2016. So many of the guests we spoke with were multiple repeaters having sailed all over the world with UNIWORLD and were still looking forward to future cruises. 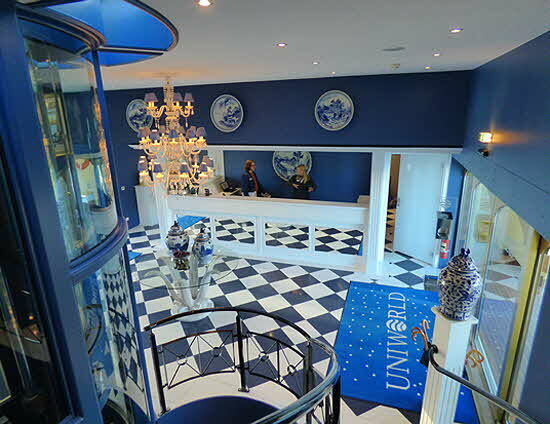 This is testimony to the attention to detail, the welcoming attitude and the small intimate size of the ships, making each guest feel like a part of the UNIWORLD family. 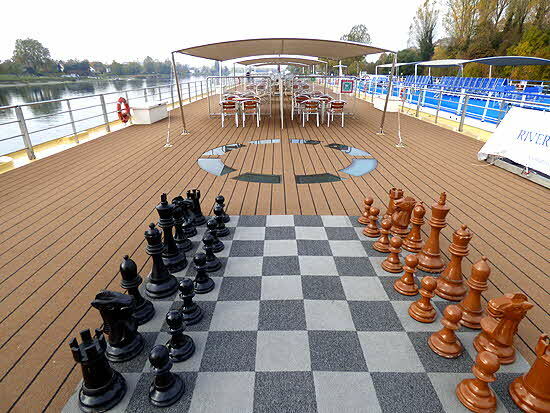 And watch for the innovative U BY UNIWORLD a totally new concept in river cruising geared to the preferences of the 18-40 age group of active travelers who want to have a more immersive travel experience without the constant moving from hotel to hotel. Two ships from the UNIWORLD fleet will be updated with a contemporary feel and revised itineraries appealing to the younger traveler who will get to experience the heart of Europe in a social atmosphere with like-minded individuals. Sales launch in March of 2017 for early 2018 sailings.